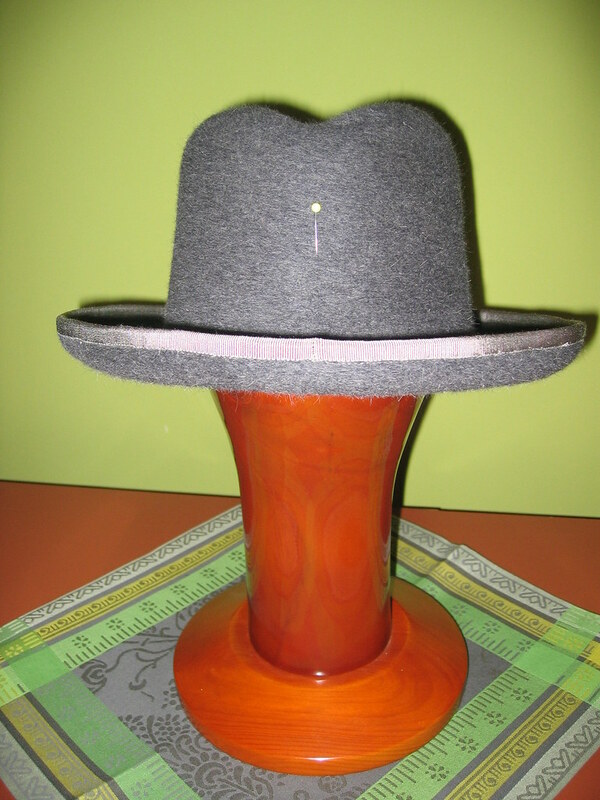 Finishing the Homburg hat – Final details!! The Homburg hat is finished, pfiuuu! I cannot believe it, I’ve been dragging this project for weeks (months?). 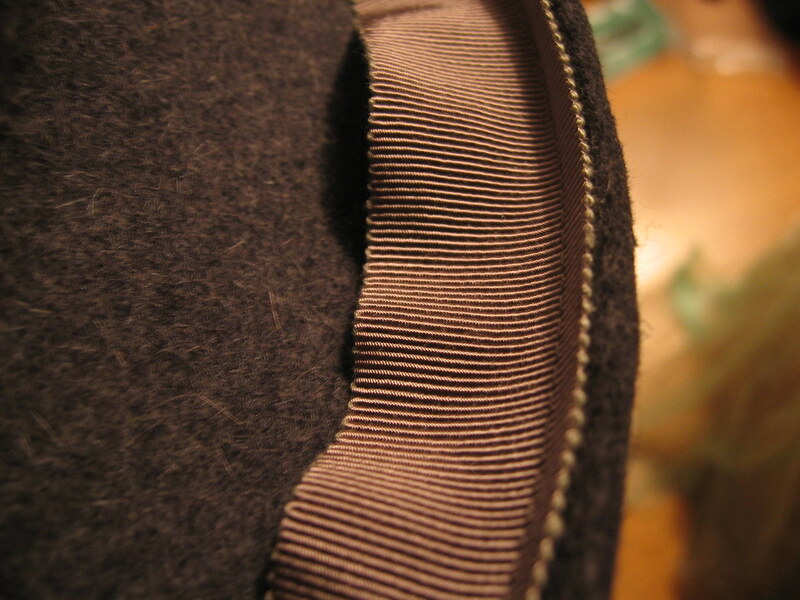 The inside sweatband is in. 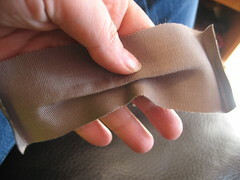 I pinned it in place, marked with a pin where it should join a the back, took it out and sew that bit by machine. The sweatband itself (grosgrain) has been slip stitched in place (well, more of a stab-slip stitch because the felt is too thick to do a real slip stitch and I didn’t want the stitches to show) . 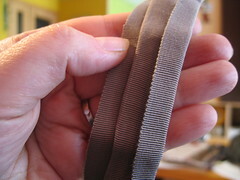 For the outside I’ve used a wide grosgrain ribbon, same color as the edge and the inside band. I’ve curved it with the iron (spraying first some water on it), and it has required some adjustments to get the right curvature so that the ribbon sits perfectly flat on the felt. Where the ends meet I’ve stitched by hand but before that and to avoid unraveling I’ve machine stitched a few millimeters from the edge on both sides (it also has helped to keep the fold in place). After that, it was time for the bow. 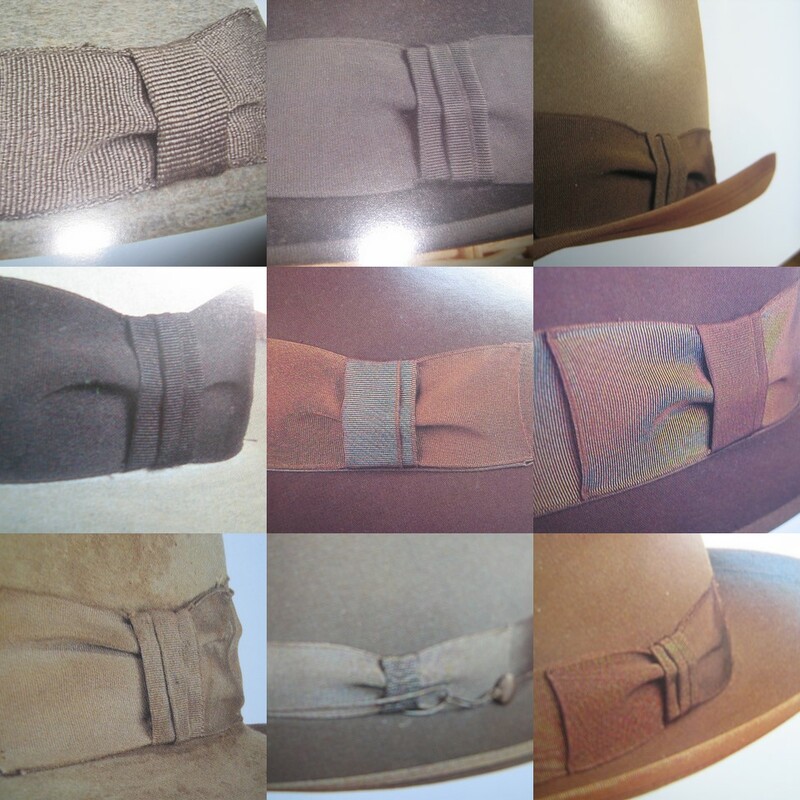 I’ve done some research, and in these pictures (click on the picture to enlarge) you can see different bows from Stetson hats (taken from this wonderful book). 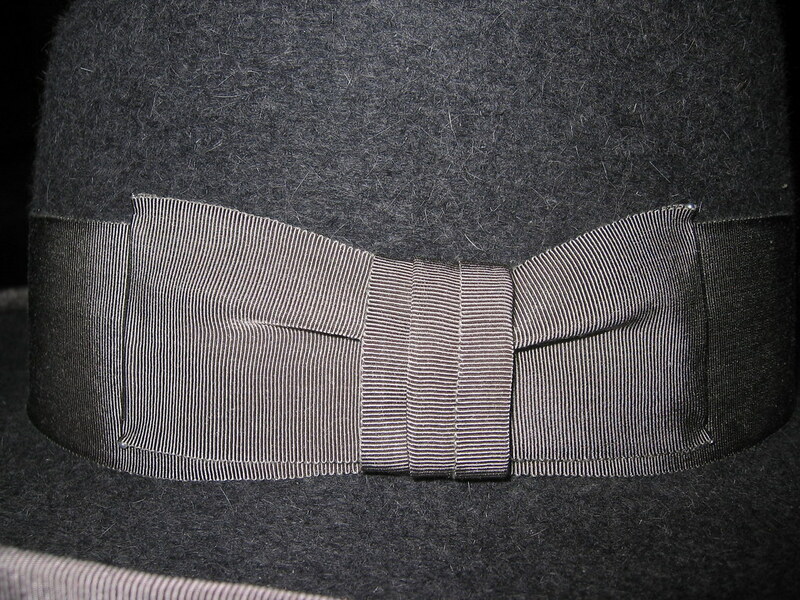 As you can see from these close-ups the bow itself is not really a bow (a real bow would have three thicknesses plus the thickness of the ribbon underneath. 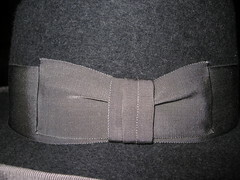 These bows are made with a single layer of ribbon, ends tucked under half a centimeter. 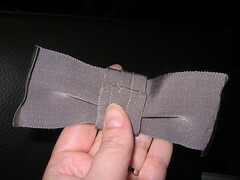 The knot of the bow is also made separately. The whole thing looks surprisingly professional in the end, but a real bow would have been too bulky. I find it quite peculiar that the fold of the bow goes towards the underside, but I think it’s done like that for a practical reason, because otherwise dust would gather there very quickly. I have chosen a folded central knot because I think it looks much nicer. What I have not done is iron any of these because it would have taken the fluffyness and natural look away. 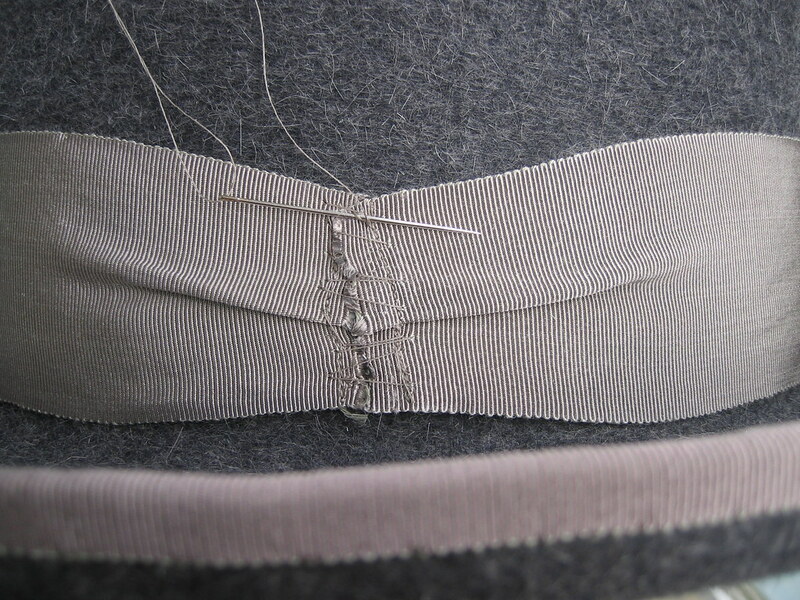 When stitching every end the whole thing stays very much in place. Have you see the wonderful initial? I got that one from Nina, she has a wonderful stash of vintage initial letters and I think it’s a wonderful final touch! 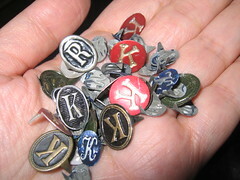 Here is a bunch of initials, so you can get an idea how they work. Basically you just push them through the ribbon and fold the metal edges (quite soft). You can take a look at all the pictures related to the making of the hat by clicking on this link. 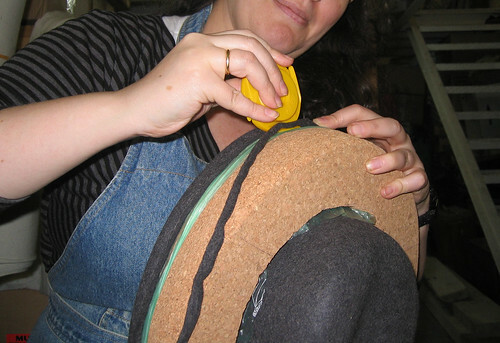 You can take a look at all the pictures related to the making of the cork blocks that were used in making the hat, and the making of the hat itself by clicking on this link. Thank you everyone for your support! 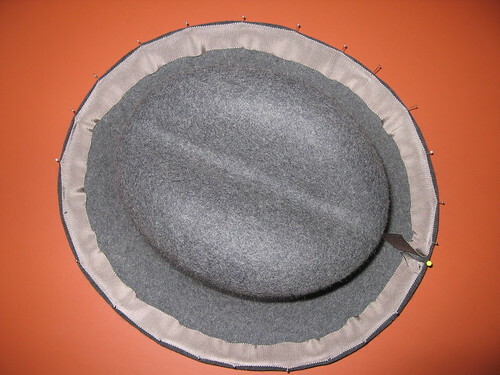 I hope to post pictures of Peter with his hat on soon! 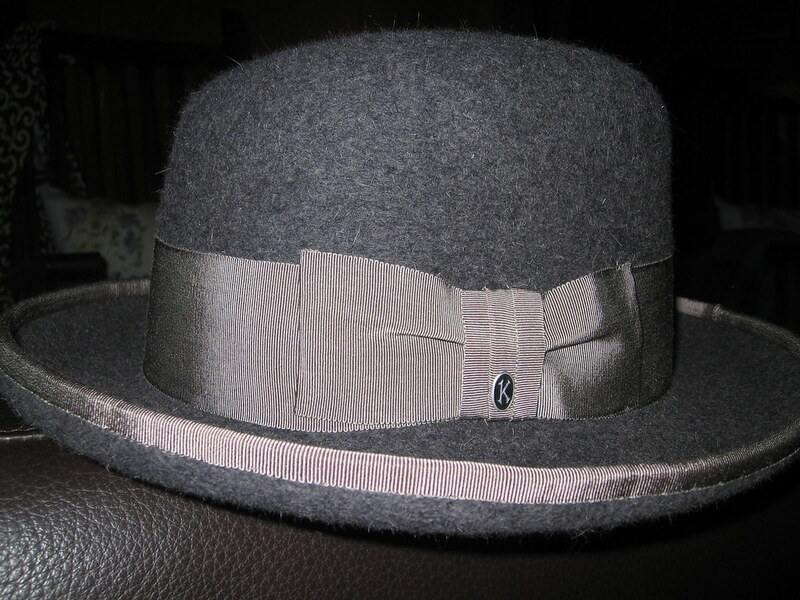 The Homburg hat is finished!… tomorrow the details! I’ve redone this posting because the html code had gone completely crazy and the more I tried to fix it the worse it became! I’ve used the sewing machine to stitch the inner edge. I realized too late that the two ends had to be sewn in advance (I thought first to fold one edge over and put the other one on top, but the three thicknesses were too much). 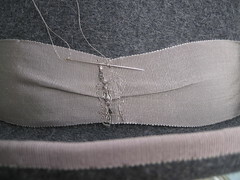 I fixed it but it was a tight spot to sew with the machine so it was not easy to (and I did not) make a straight line. 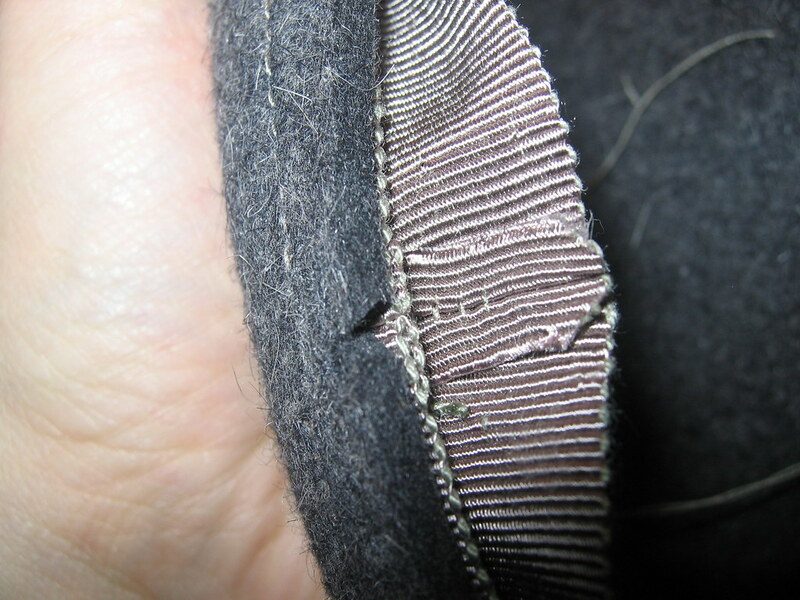 My new sewing machine has done a great job stitching through the felt and grosgrain. The foot can be lifted really high and that makes it easy to work with felt. 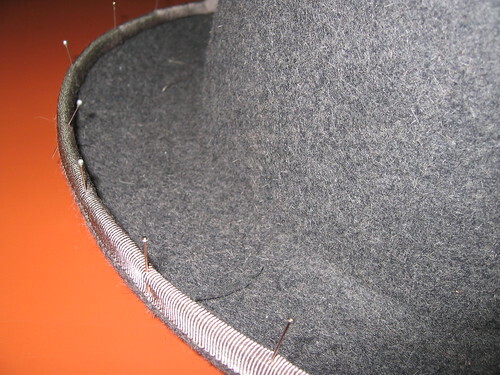 Obviously the crown was on the way but I worked around that somehow, and I had to stitch further in than I wanted, because otherwise the feed dogs would not drag the felt. 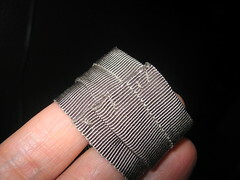 Here you can see how I cut the top corners of the grosgrain to reduce bulk (they were popping out when I folded the ribbon which looked terrible), I carefully dabbed some white glue on the edge to avoid unraveling. I have also cut a notch on the felt so that the extra thickness can sink in there and be less obvious. 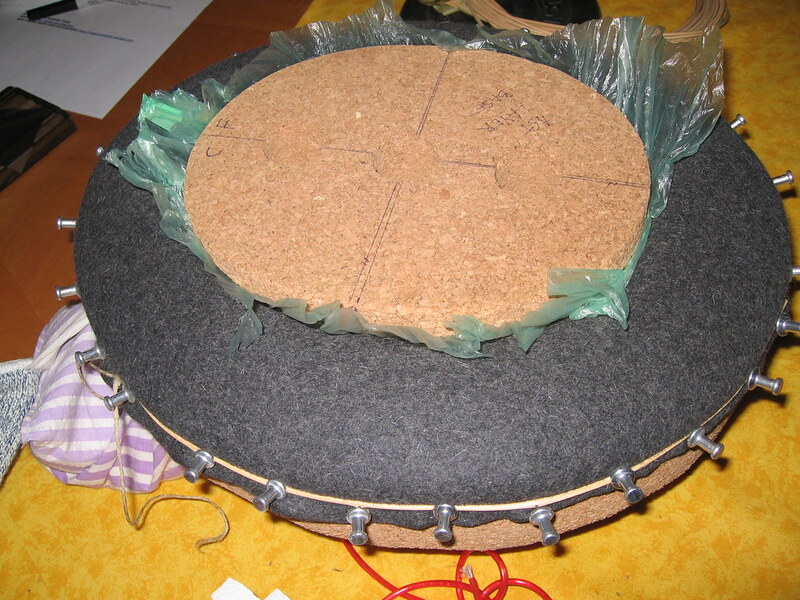 In the next picture you can see the edge turned over, ready for slip stitching by hand. The back looks pretty neat, all things considered. Next thing is the sweat band… working on it! Please check the updated posting here (I had to delete the one here because the html had gone crazy). The crown block is finished. I have adjusted the shape a little bit more and have called it a day! Notice that I have traced the edge of the headsize with a pen, that way I will immediately notice if I start sanding that by mistake. I’ve already reblocked the crown and it’s drying, so my next posting (soon!) 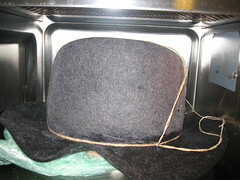 will be about trimming the hat. 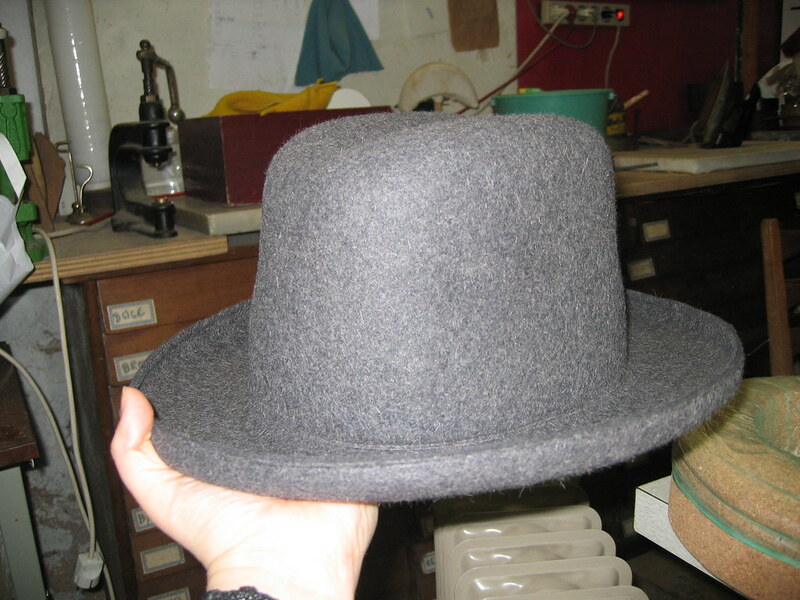 I’ve been under the radar for quite a few days because of a family trip to Holland, but I have now a few hat stories to tell you. Before I do that I want to give you a little update on my homburg block/hat. After some heavy sanding and filing I blocked the hat crown again. 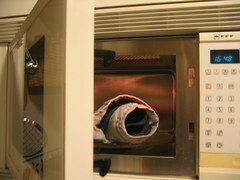 No microwave this time, instead I put the kettle on the stove to get some old fashion steam. Then with the help of my small travel iron and a wet cloth (which in combination produce a lot of steam) I managed with no problems to reshape the felt. 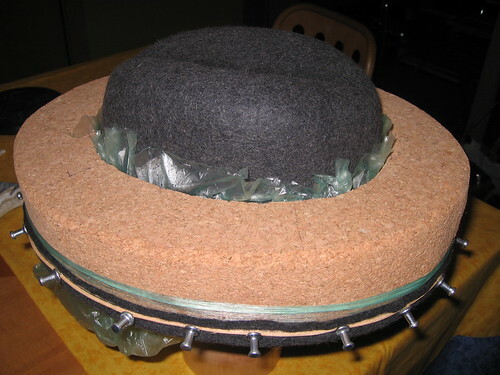 On the down side, when I tried it on Peter again I could see that I had improved but it was not yet comfortable to wear, so I will give it another go soon (some more sanding and reshaping) because I want to be finished with it and move on to something else (possibly another hat block for myself this time). 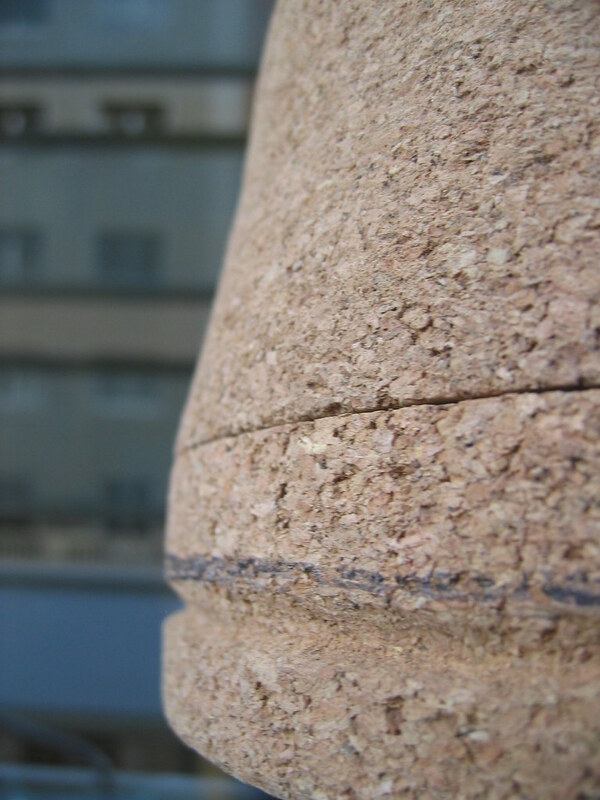 You might look at the pictures and think that the hat looks exactly the same as it did before, but I can promise you that I retouched it so much as to produce a thick layer of cork dust covering the floor of the balcony. 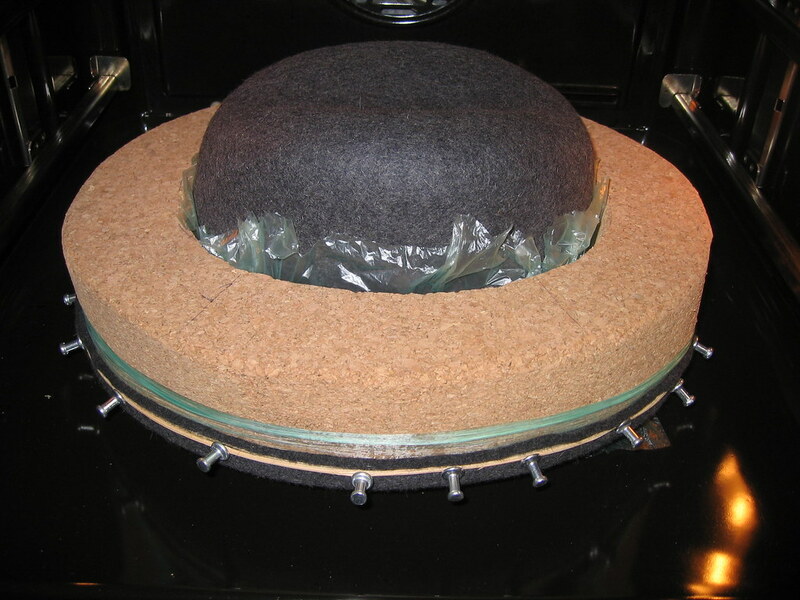 It’s a fact that it sinks in too low for it to be comfortable, but I’m getting some doubts on whether the inner top of the hat should really rest on top of the head. 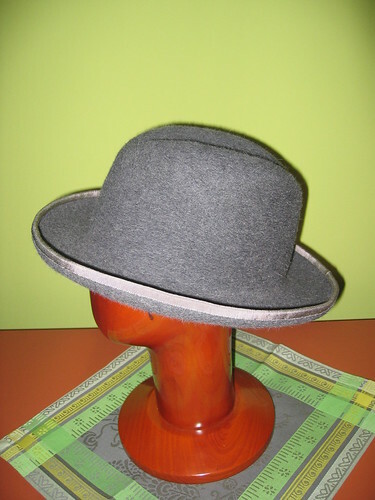 I’ve seen some old pictures of men with high hats and it seems pretty obvious that the top of the head does not reach the top of the hat! Follow this link for a clear example! 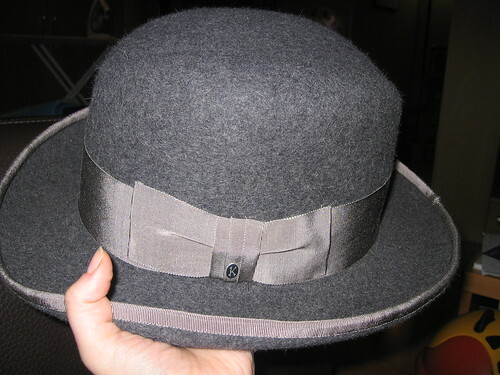 How on earth they were made to be comfortable I don’t know… perhaps once the headsize is the right one then the hat stays in place, but with the ribbon still to go it could be that the hat is now too big. 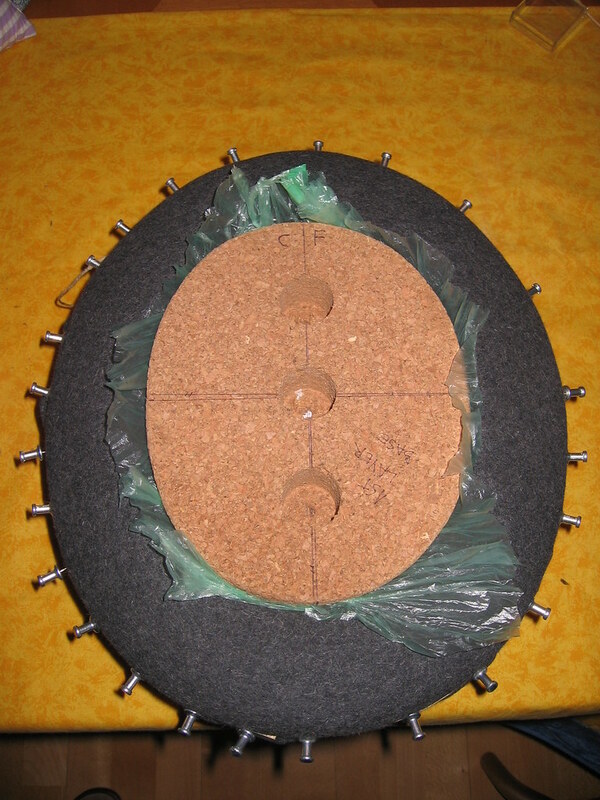 Another thought I’ve had is that possibly it would be more comfortable if the sides hugged the head a little bit, so my next modification of the block will go in that direction. I am open to suggestions, so please let me know what you think! Finally I took the felt out of the block but not before trimming out the excess felt with a new toy I recently bought myself at a craft fair. 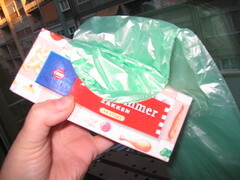 It’s called a chenille cutter made by Olfa. It’s similar to the paper cutter from 3M that I showed you on this post, only this works much better because it’s intended for cutting several layers of fabric, and the manufacturer even says that’s good to cut felt. I thought it was made to cut chenille, but after looking around on the web I see that it’s meant to make chenille, or at least something that looks like it, pretty cool actually. 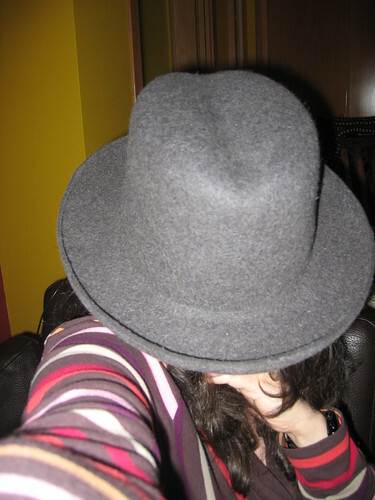 Well, back to my hat. I was very proud of myself after I unblocked. It looked like a hat! It looked pretty darn good! 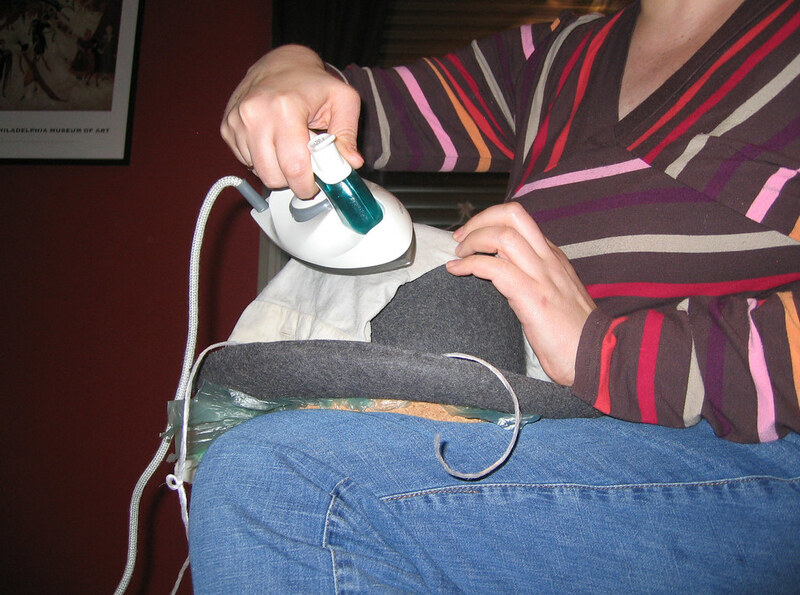 It does looks like a hat… I know it sounds silly but I was imagining everything that could go wrong and was not so sure about the whole thing. 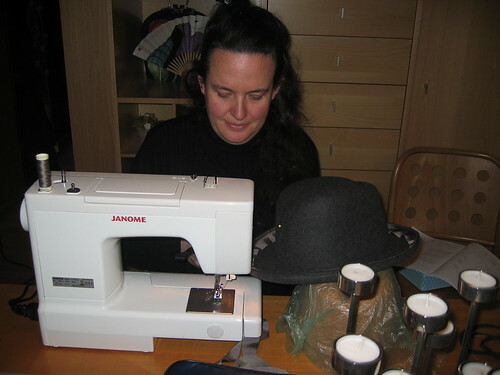 I unblocked while at Nina’s workroom and immediately realised that it was too soft and needed some stiffener. 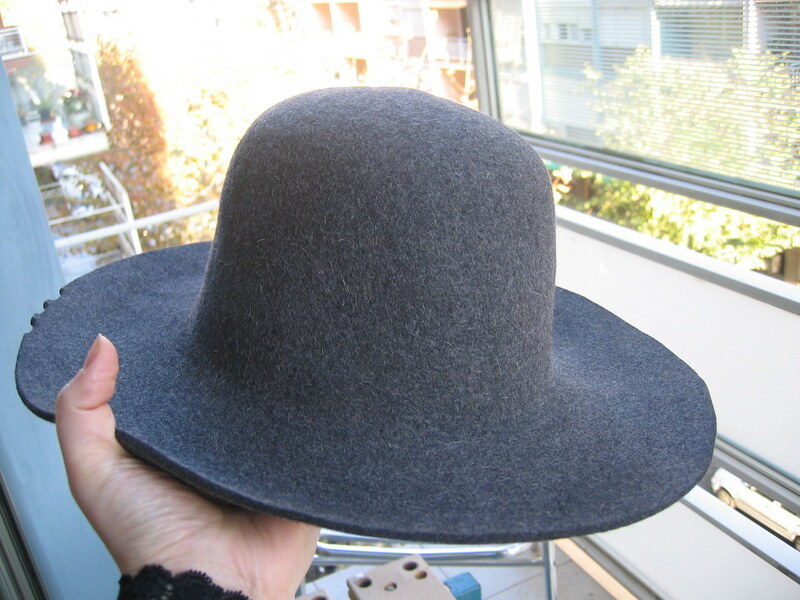 I used the chemical smelly stiffener because it would not have been a good idea to use the waterbased one since the hat might have lost it’s shape. 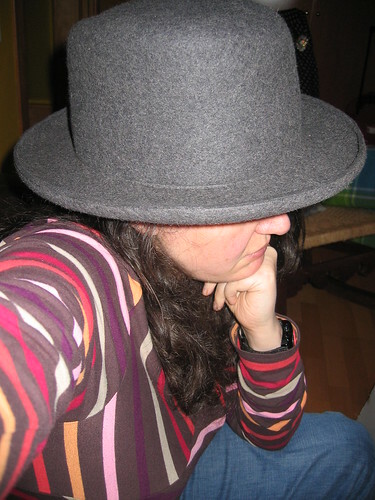 I felt wonderful and held the hat in my hand all the way back home (in the bus)… people must have thought I was nuts. 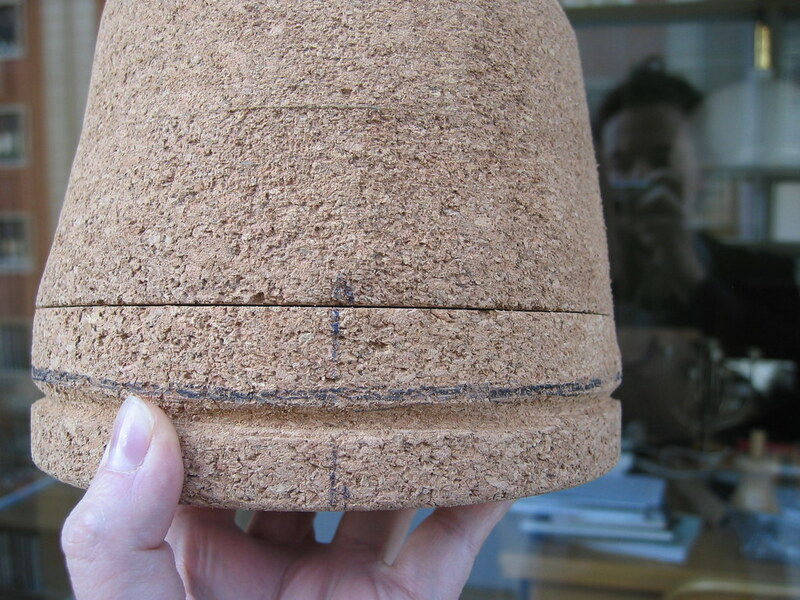 Making a brim block out of cork – Blocking the hat!!!!! 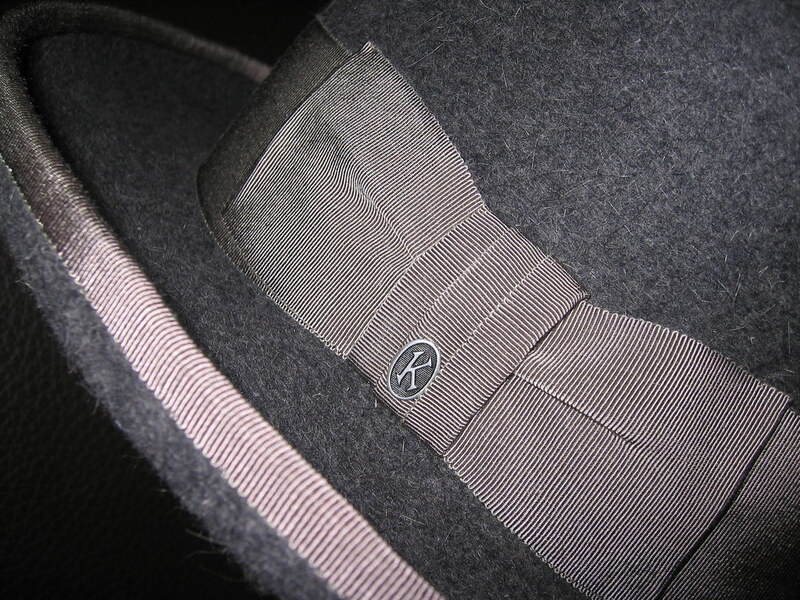 It seemed like the day would never come, but finally I have dared to block the felt on my wonderful new blocks. 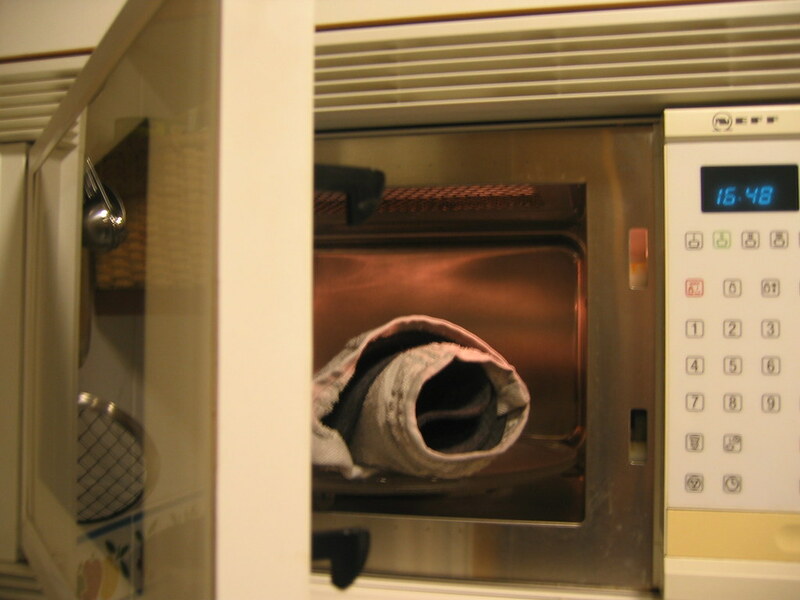 Still too lazy to dig up my jiffy steamer from under a pile of boxes I have popped the water sprayed felt, wrapped in a wet towel, into my microwave. This is the fur felt capeline I have used, bought at the German supplier KOPKA, it’s a special capeline for man’s hats. 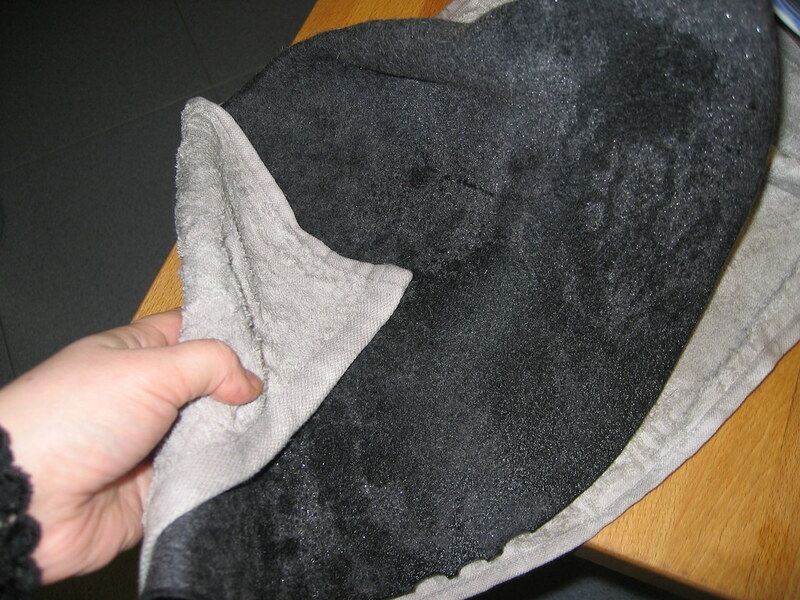 It’s special because because it’s thicker felt and heavily sized. I might still get a decent hat out of this… who knows! 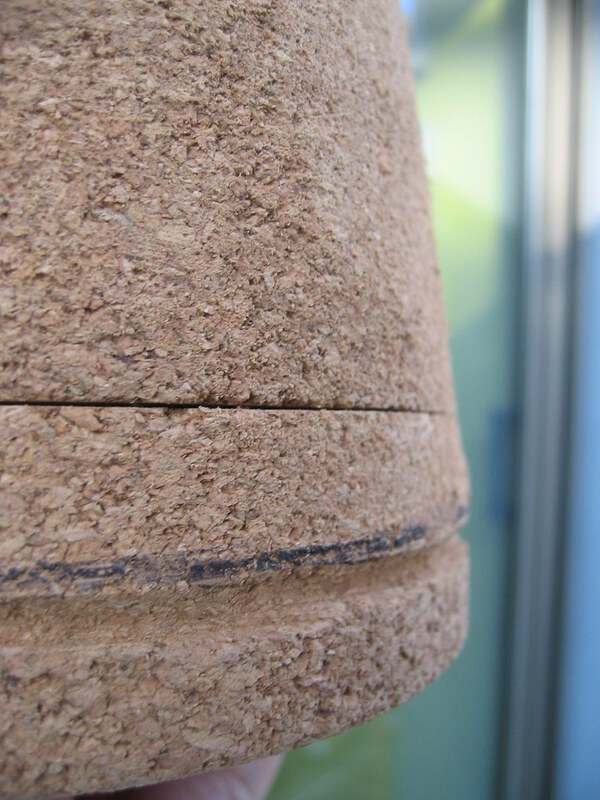 Tomorrow the unveiling/unblocking… I hope to have time to post about it!